Is this the species that started it all? 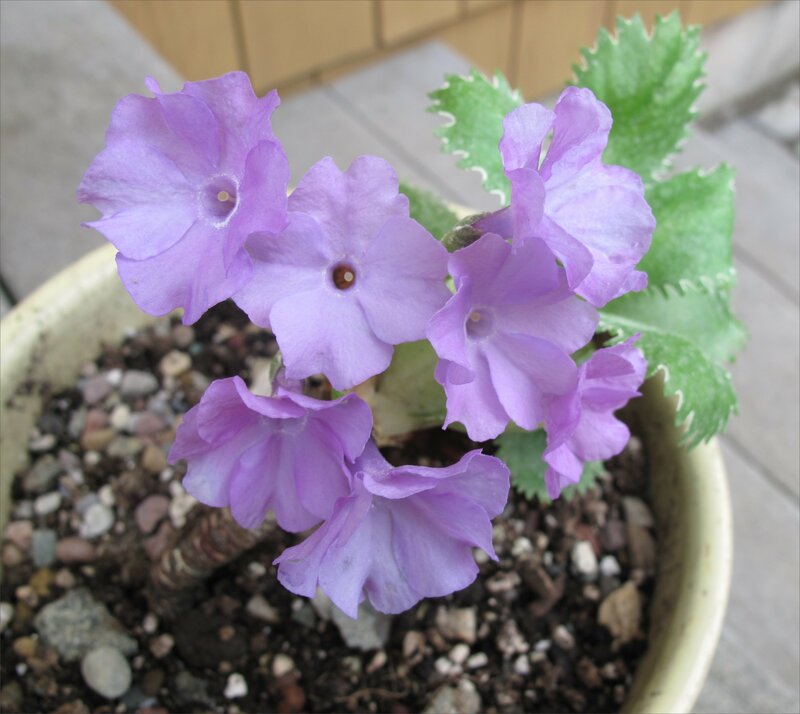 Can the popularity of those ubiquitous supermarket and convenience store primulas that show up in early spring be traced to this amazing little alpine? 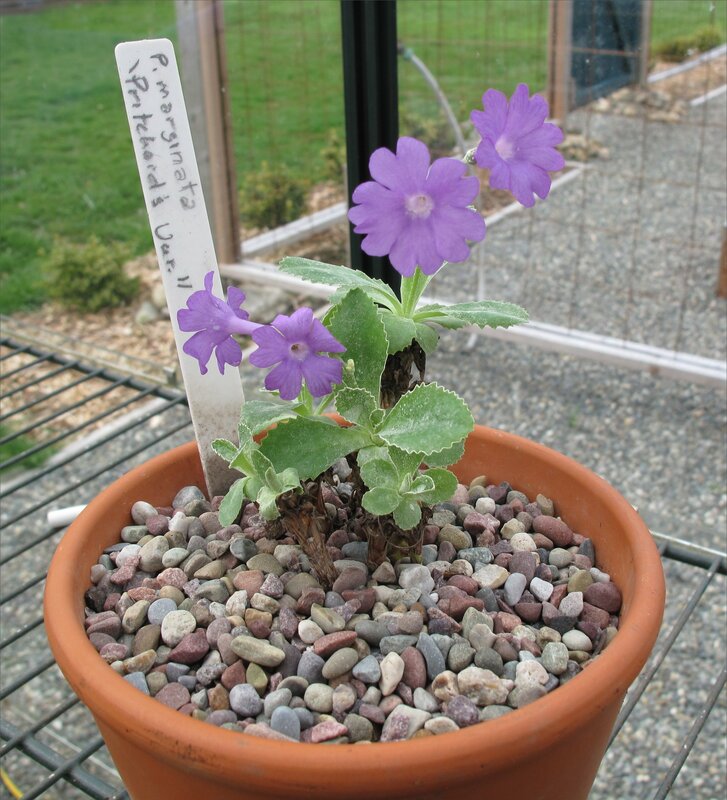 Primula marginata was first described in cultivation sometime between 1777 and 1781. The species is primarily found on shady limestone cliffs in the Maritime and Cottian Alps, which are located on the border between Italy and France. P. marginata is prized both for the beauty of its serrated and powdered leaves (the powder is properly called farina), and its blue flowers. The plant, both in the wild and in cultivation, is highly variable in shades of the blue flowers and also the size of the jagged teeth at the leaf edges. Many hybrid cultivars exist. 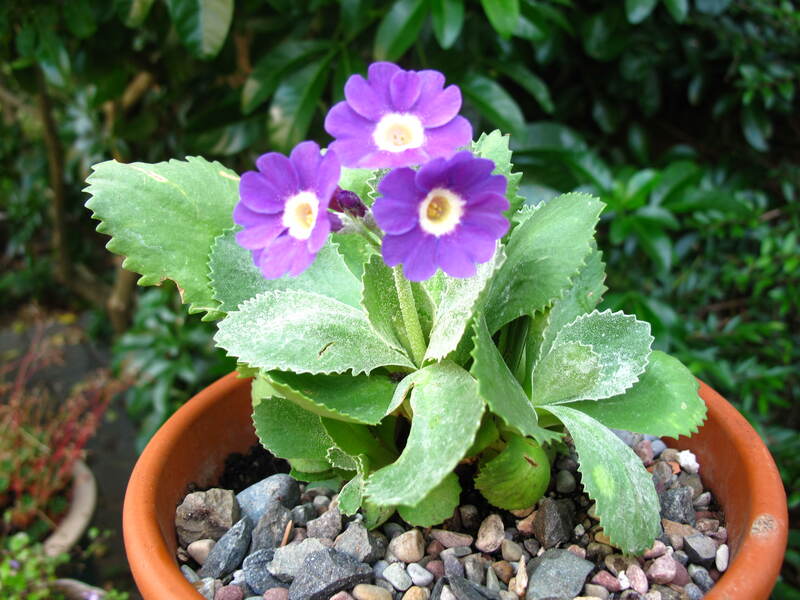 Primula marginata belongs to a subsection of the Primula genus called Auricula. 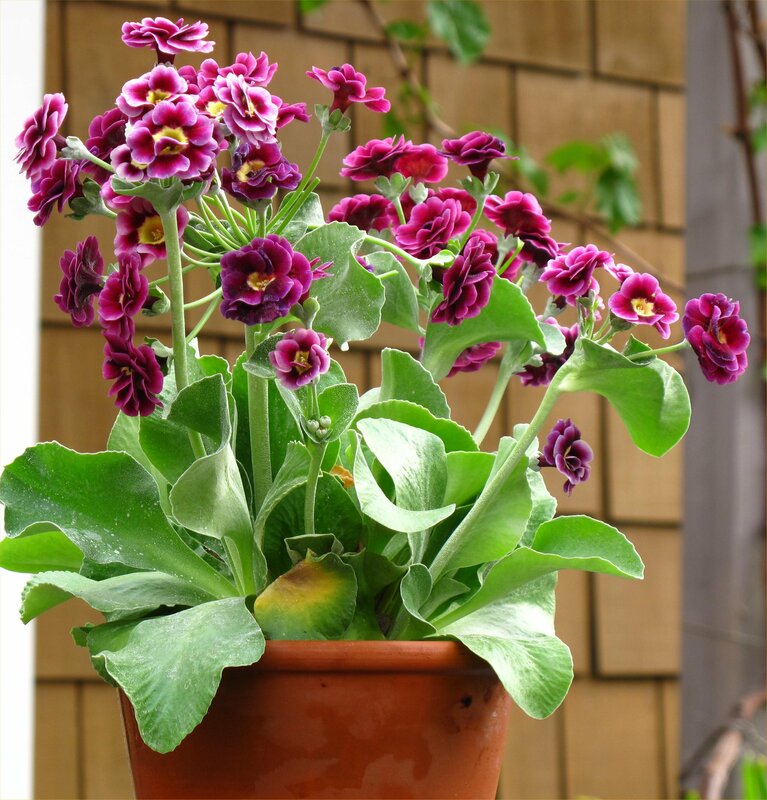 The auricula species was known to central Europeans possibly four or even five centuries ago as the “yellow bears ear.” It’s the wild plant that gave rise to the garden and show auriculas prized by the British. Garden auriculas do not have the serrated “toothed” leaves that P. marginata displays, but clearly the two species hybridize readily. The flowers of Primula marginata cultivar ‘Mauve Mist’ shown below are probably the result of a cross between P. marginata and an auricula primrose cultivar. According to John Richards, in his seminal work, Primula (published by Timber Press, Portland, Oregon,1993), P. auricula has been a popular garden plant for at least five centuries, and indeed was one of the first decorative plants to be cultivated in Europe. 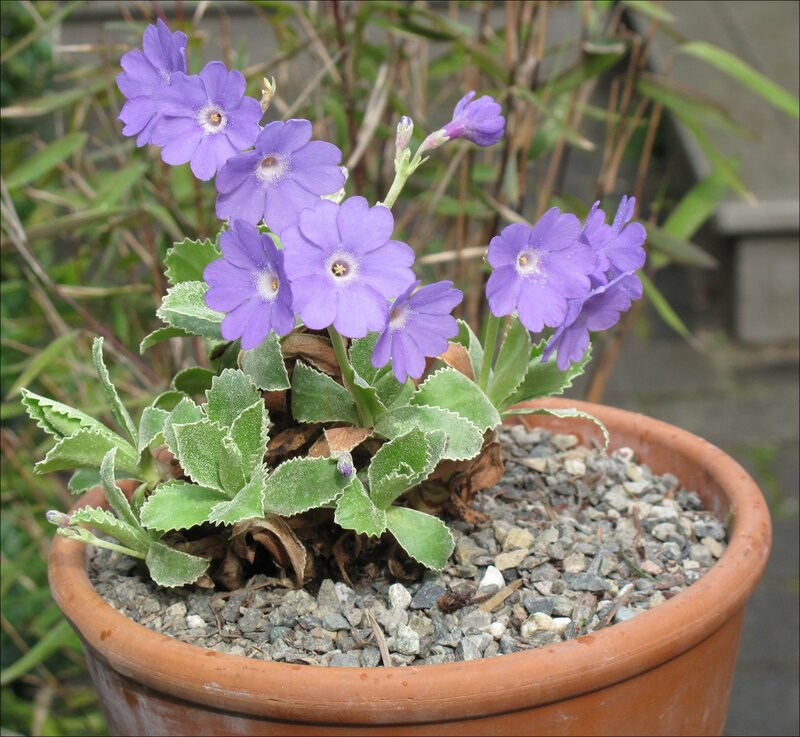 The social life of the Lancashire mill towns in the Victorian era often revolved around Auricula societies and their shows, where considerable sums of money could be won for a prized plant! This entry was posted in Alpines and tagged Auricula subsection, garden auriculas, Primula marginata, Primula marginata 'Mauve Mist', yellow bear's ear by Bart Arenson. Bookmark the permalink.